Click on the image twice to enlarge it. Crabbing with my friend Dustin at Yaquina Bay. My friend Dustin is an avid fisherman and fishes the Upper Rogue out of his family home in Ashland. Click on the images to enlarge them. Zach from Big Spruce R/V Park in Netarts shared the method he uses to clean crabs. 1. Center the knife blade over the body of the crab. 2. 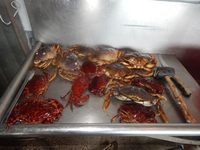 Strike the knife blade with the rubber mallet to cut through the crab's body but not through the crab's shell. 3. Hold the crab carapace down with your left while grasping the crab's legs and claw with your right hand. 4. Wrap your fingers around the crab's legs and claw segment and push and pull the left side of the crab's body and legs away from the crab's carapace. Practice makes perfect. the more crabs you clean the easier and faster cleaning crabs becomes. 5. While holding the left side of the crab's legs knock the crab butter from the crab's body by rapping the palm of your hand against the edge of the trash container jettisoning the crab butter into the trash container. 6. Pull the gills from the crab's body and discard them into the trash container. 7. Remove the mouth part by pulling and twisting the mouth part from the crab's body. 8. The left half of the crab is ready to cook. Double check the crab making sure you have removed all of the gills. 9. Repeat the steps to clean the right side of the crab.